I truly believe that 10 years ago no one could have predicted how much the humble mobile phone would change us; this increasingly complex gadget has brought upon a revolution not unlike the first call across the Atlantic, and is still going strong! With this in mind, you should design all your future mass emails for mobile phones as well as desktop view. Because the no. of mobile phone users is increasing daily. Currently, there are over 5.9 billion mobile subscribers (that’s 87% of the world population). Because smartphones amount to more than 1 billion mobile phones, from a total of 4 billion that are actively in use. Because about 4 years ago, 60% of the decision makers in corporations around the world were reading emails on a Blackberry or other smartphone (that was the situation 4 years ago, nowadays the percentage of businessmen emailing from their phones has surely increased). Because by 2015 it’s estimated that mobile internet usage will surpass desktop usage. Because one half of all local searches are made on mobile phones. Because on average, we spend more than twice the time fiddling our phones than we do eating (Americans, for example, spend roughly 2.7 hours/day on their phones). I could go on, but I think I made my point: email on mobile phones is the way to go for email marketing, and with statistics as optimistic as these, you should get on the wagon as soon as possible! 1. The all-important subject line. This refers mostly to their size (always take care to balance quality with file size), but also to their names. Since some phones can’t display images in emails, most of your recipients will be put off by seeing image3.gif. Rather, name all the pictures accordingly: Red_model_Sprocket.gif, Sprocket_logo.gif etc. Additionally, you should also include Alternative Text for all your images, since some mobile email clients will display a blank box instead of the filename. Since not everyone can afford a smartphone that can display HTML, including a plain text version just shows that you care and take time thinking about your recipients. Even between smartphone users, there are many on limited data plans and “text-only email” advocates, so this little amount of effort will go a long way. You no longer need to choose between having a good-looking email and one that is displayed accordingly on all devices, since resolutions are getting quite similar between the two main contenders (handhelds and desktops). Along with the increasingly complex and feature packed applications for mobile phones, emails will generally look as great in Outlook as they will on your gadget of choice, but since the screen sizes will be different you should take care in the layout of your messages. This means that including links to all useful websites in your emails for mobile phones is a must (your homepage, contact email, product page and so on); take care not to crowd them in the same place, though (they’re harder to click on with a finger than they are with a cursor)! Likewise, try to keep the layout as fluid and simple as possible (no special bullet points, paragraph spacing etc. ), so that no matter where and on what, your recipients will always be able to read your emails. It doesn’t matter if you don’t own a smartphone, tablet or other gadget – chances are that you know of someone who does! So, try out your first email designed with the above points in mind on any and all configurations you can – different browsers, mobile phones with and without HTML capability, smartphones with as many OS flavors as possible! This will ensure that the majority of recipients will be able to read your email, and you only need to do it the first couple of times. After each test you will learn something new, and in a small matter of time you’ll grow adept at the new art of designing emails with mobile phones in mind. Lastly, if you’re looking for an easy to use tool to get your email newsletter going, just take a look at Easy Mail Merge for Outlook. You’ll be able to create your subscriber list, compose, personalize and manage all your mass mailing needs with just a few clicks, and at $29.95 it’s a steal (the normal price is $39.95, but if you email us at support@emailaddressmanager.com we’ll throw in a $10 discount coupon)! 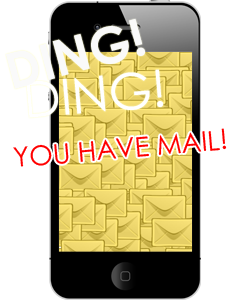 Do you have any information about designing emails for mobile phones? Please let us know either at the email address above or in the comments section below, we’re always happy to hear from our readers!